If vampires were small and crawly you know what they’d be called? Ticks. Seriously, these tiny blood-sucking insects are a nightmare! Moreover, the fact that these pesky creatures have the power to hurt your fur babies makes them all the more hateful. Ticks- ugh! Every dog owner who has had an experience with them knows what we’re talking about. They’re difficult to spot and notoriously difficult to dislodge. And if not noticed for a long time, these buggers can cause some serious diseases. Don’t worry though; these bloodsuckers can be defeated. Listed below are a few simple natural remedies to remove ticks. 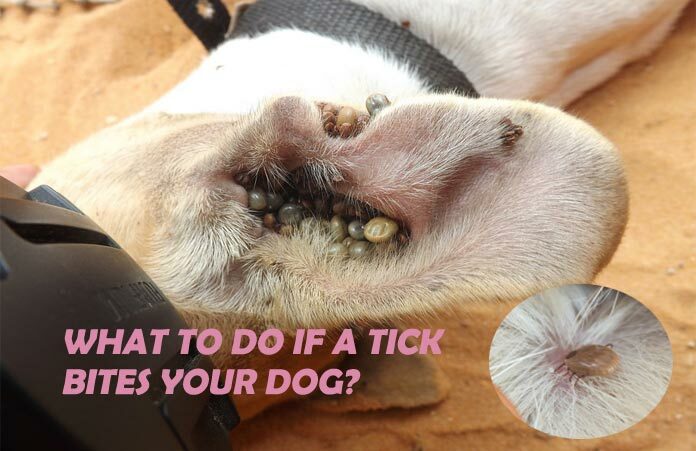 We have also tried to shed light on the tick bite treatment that you can apply if your dog has ticks. So, Why Do Ticks Tick You Off? Is that even a question? Other than being creepy and disgusting, ticks also are responsible for transmitting various skin diseases and infections. In fact, ticks are perhaps the worst pet-related bugs you would encounter. They’re even worse than fleas. Tick bites are pretty hard to trace and identify as your dog doesn’t really feel any pain or discomfort when bitten. The infection takes about a day or two to develop and gradually spread across the body. However, if left unchecked, the dog might suffer from rashes, inflammation, severe itchiness and mild fever. The more serious consequences of ticks are Lyme disease in dogs, anorexia, and anemia. Most tick diseases in dogs aren’t transmitted immediately. These blood-sucking insects have no special jumping skills or wings like fleas to help them hop from host to host. Ticks can only crawl and are likely to stick to just one body. If you manage to get the ticks off your dogs within 24-36 hours, your pet is safe. Therefore, it is imperative that you regularly check your dog for ticks and take care of his hygiene. The easiest way to do this is to pick up a tick comb or a pair of tweezers. You can also wear gloves and finger comb your way through the fur to detect any traces of ticks, but that’s time-taking and exhausting. Ticks love warm, dark and moist places on the body so pay particular attention to those spots. For instance, deer tick that lives on dogs very comfortably but can not survive 24 hours on its own. Also, begin the tick examination in a well-lit area as these insects can not be spotted easily and have a penchant for slipping past undetected. Neem is well-known for its medicinal properties and is a powerful anti-bacterial and anti-inflammatory agent. It is also an antiseptic that naturally heals the damaged skin. Take a few drops of neem oil and gently rub it along the places you feel are most susceptible to ticks. In case your pet has sensitive skin, you can dilute the oil to prevent any irritation. You can also mix other oils with neem such as vegetable oil, cinnamon oil, eucalyptus extracts for better results. Neem oil when mixed with liquid soap and water can also be used a rather effective spray solution that yields quicker results. Apple cider vinegar is another anti-bacterial solution that is great for eradicating ticks. Rich in vitamin C and other minerals, the mixture when diluted can be either be directly massaged on to the skin or be sprayed on the infected area. To make the apple cider vinegar spray you need mix one cup of apple cider vinegar in four ounces of warm water. Add some salt and baking soda to the solution and pour it in a spray bottle. Shake well before using it. Apple cider vinegar can also be used with lavender oil. Mix ¼ cup of ACV with 15 drops of lavender extracts and apply it directly on the dog’s fur. Garlic works wonders when it comes to removing ticks. The powerful smell and anti-bacterial properties of garlic successfully repel fleas and ticks. You can include small doses of garlic to your dog’s diet. The garlic-induced secretions then prevent the infestation. Contrary to what people think garlic is not toxic to dogs. It can be a nutritional health supplement when consumed in the right amount. Add about 1/3 tsp of freshly chopped garlic for every 10lbs of your dog’s body weight. The best way to remove the ticks is to actually remove it. Don’t fall for those remedies like applying Vaseline or nail paint on the dog to trap the ticks. Instead just grab a pair of tweezers and get the job done. Hold the tick by the head and try to pull it out of the dog’s skin in a firm yet gentle tug. Don’t jerk or twist your hands as it might give the tick a chance to escape. The spot-on treatments available over-the-counter or online are usually effective in curbing the infestation and curing your dog of the tick bite. The drops or topical medications have to be applied to the dog once every month to keep the fleas, ticks, lice and other biting insects away. Spot-on creams deposit on the skin of the animal and release their tick-repelling ingredients over the course of several weeks. These treatments are water-proof and hence suitable for dogs who love staying outdoors. Tick dips were a popular cure for dog tick bite back in the day when there weren’t many viable treatment options available. The dips are sold in the concentrated form; you will have to dilute the dip with water before applying it to the animal’s fur. Do not rinse it off immediately; let it settle for a while before you wash it away thoroughly. Unfortunately, some of the brands out there are believed to have pesticides and harmful chemicals. Check the ingredients of the product carefully before buying it. Tick powders are another topical treatment option that has to be applied directly to the dog’s body. Check the ingredients before purchasing the product. Also, avoid applying powders on young puppies. Their skin is very sensitive and the chemicals present in the topical medications might cause irritation and infections. Take a small amount of the medicated powder and rub it gently on the fur. Make sure that neither you nor the dog inhales the medicine- keep it away from your eyes and face. Tick sprays are a ready-to-use instant solution to tick bite treatment in case you don’t have any oral medications or creams available. You can either make your own herbal spray or get one from a pet store. Either way, make sure that you apply the spray from a safe distance and that it is out of the reach of children. Tick sprays far more effective than say shampoo or other topical products. However, its effects are short-lived and hence the treatment must be repeated regularly. 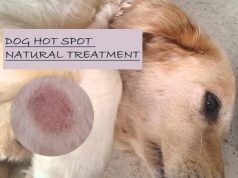 While other treatments discussed above are all about removing the ticks and treating the bites. Tick collars are more preventive in nature and are concerned with keeping the pests at bay. A tick collar protects the neck and the head area of the puppy. Note that the collar needs to be in contact with the animal’s body in order to transfer the chemicals on the fur. Make sure that the collar is attached comfortably on the dog- it must neither be too tight nor very loose around his neck. Watch out for any sign of discomfort and don’t hesitate to contact a professional in case there is an allergic reaction. 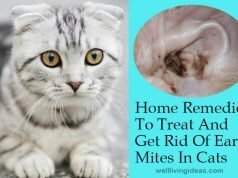 One of the easiest and most affordable ways of treating tick bites and removing the existing ticks is using a tick shampoo. The product is specially designed to suit the dog’s fur and gently clean the ticks away. Bathing your dog with a tick shampoo kills the tick on contact- although it is a time-taking and labor-intensive process. You can manually lather and thoroughly clean out the ticks in dog ears, under the feet, in the belly etc. However, the medicated shampoos don’t last long; you will need to repeat the process once or twice a week. 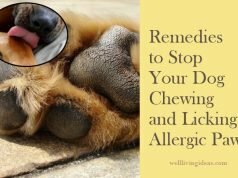 Most veterinary doctors prescribe medications and oral tablets that have to be fed once or twice a week (according to the instructions of the professional) to completely wipe the ticks away. Oral medications are also effective in disrupting the life cycle of fleas and other biting pests that might otherwise harm your pet. These meds are easy to give- you can mix it in the dog food or in his water bowl. Medicated products for all the benefits can be harmful to your dog if he has sensitive skin or is allergic to the contents of the product. There are several organic treatment options for tick bites in dogs that don’t pose a threat to your pet’s well-being. Herbal repellents like eucalyptus extracts, garlic, neem, and other essential oils work wonders on your dog’s skin. You can make your own herbal collar at home or get one of the natural dog sprays or creams on the market instead of using chemicals. Keep the house and backyard clean- vacuum the house regularly, mow the grass etc. Avoid depositing the removed tick directly in the dustbin; they’ll just crawl back up. Kill them with alcohol or flush them down the toilet. Your troubles don’t simply end after removing the ticks from the dog’s fur. These pests have a habit of coming back time and again unless killed off for good. You don’t really want to spend the summer picking out the ticks from your dog’s fur now do you? Keep a close eye on your pet over the next few weeks and lookout for signs of fatigue, loss of appetite or any swelling. In case you find any of these signs, take your dog to the vet immediately.